I love my new flat as it has so many traditional Glasgow tenement features, such as the stunning fireplace. 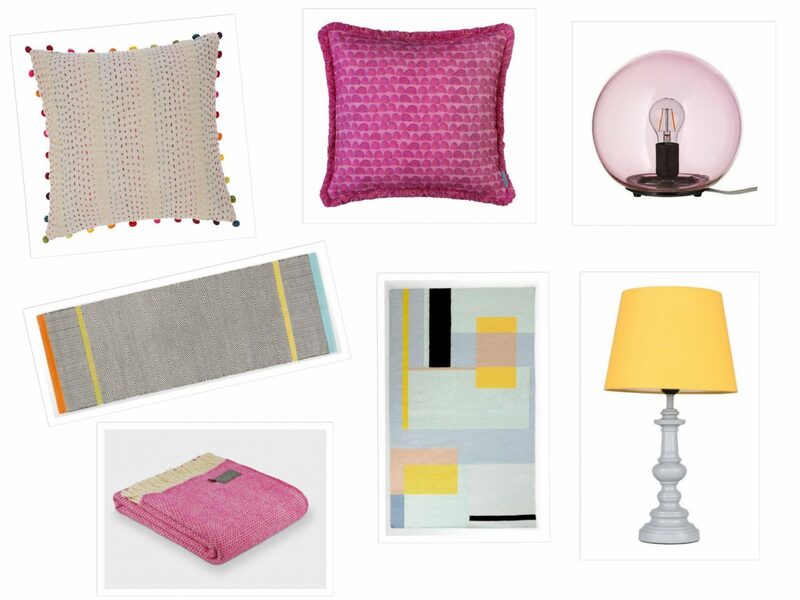 However, I’d love to add some pops of colour to each room. I’m a real colour addict, so I’m thinking about adding some bright, colourful pieces of furniture to each room to show off more of my personality. I’ve put together an edit of the best rainbow interior items that i’ve found online. I’d love to swap the chairs round my kitchen table for a few colourful cocktail chairs, as they are so much comfier and look so much nicer. They would also really brighten up quite a dark corner of the kitchen. I love this bright mustard yellow, and i’ve been wearing it all year, so why not add it to my home too?! It’s such a happy colour. This chair from Swoon Editions looks so chic and luxurious, and I need it in my life. I like the handiness of having bedside cabinets, as it’s where I keep my current skincare and my sleep enhancing products. Although, I think that a couple of bright pink side tables like these bargain ones from The Range would look so much better and add more personality and life to the room. This table looks so much more expensive than it is, so it’s a really affordable way to make some colourful furniture switches in your home. I want to add a colourful chair to both the bedrooms in the flat. It’s not so much for sitting on, but more to be a ‘chair-drobe’ – a place to drape clothes when i’m too lazy to put them away. I love the boxy nature of this chair, and the fact that it’s a mixture of a more demure grey as well as the bright turquoise. It’s actually an office reception chair, which shows that you should check out furniture sites that you wouldn’t necessarily think of when you are looking for chairs and tables. Calibre Office Furniture has so many bright, rainbow options. We could really do with a tall lamp in the living room, as sometimes the wall lights are too bright. This would be perfect for relaxing at night-time, and it would be a real statement piece in the room. This multi-coloured floor lamp from Iconic Lights is such as bargain as it looks like a real designer piece that you would find in the likes of Habitat. Why have a boring bookcase when you can have a pink one?! This one would really allow me to make a stamp of my own on my hallway, as it’s quite boring and dull at the moment. This one from Wayfair is a beautiful, muted pink that would fit well in a bright or a vintage-styled house. I can’t believe that I didn’t know about the Vinterior site before now. 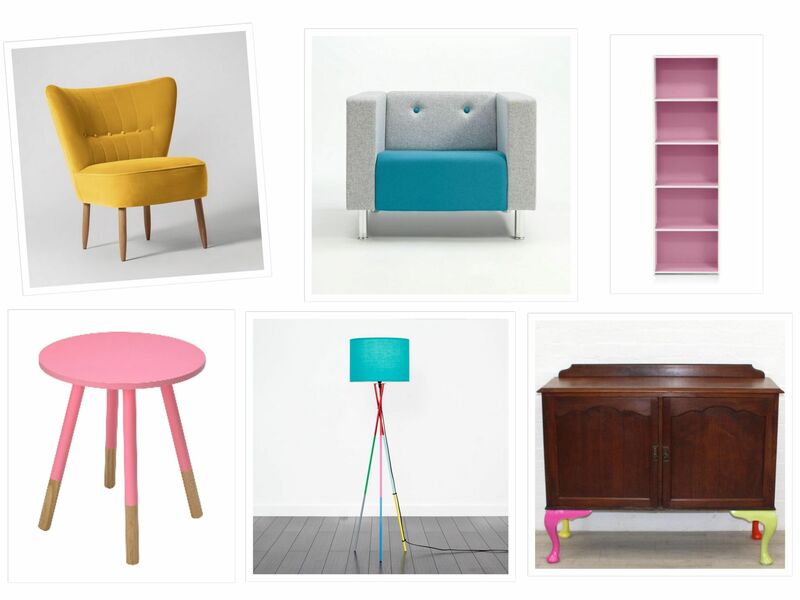 Independent designers and upcyclers take vintage and second-hand furniture and give them a new lease of life. This basic sideboard is transformed by it’s colourful legs and now looks amazing. I’d love to make some more time to upcycle some more furniture, as i’ve really enjoyed doing it in the past.